Our entire Moisture White™ Shiso range is inspired by the humble herb shiso which is a member of the mint/basil family and believed to reduce early melanin-making signals for brighter, more luminous skin. Delivering superior skincare benefits, Moisture White™ Shiso BB Serum Inside instantly brightens, corrects, protects and cares for your complexion, making it the multi-tasking must-have for busy, time-pressed mornings. With a wonderfully lightweight, smooth texture, our sensational serum-infused BB Cream is a joy to apply. 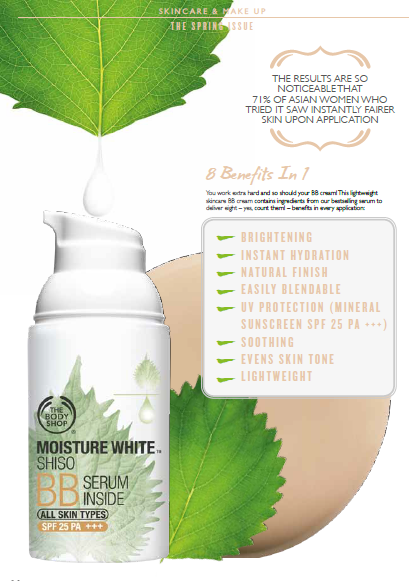 Suitable for all skin types, its radiant beige shade was specially developed to suit most Asian skin tones. The good level of coverage provides a natural finish. Perfect!